Looking to reduce noise and also retain the heat in the winter and the cool in the summer? Replacing your worn or missing sound barrier "Cabin Insulation" will cure what ails you! Our products are produced for your 1979, 1980, 1981, Firebird & Trans Am. This is a fire wall pad for 1970-1981 Camaro or Trans Am NON AC car. This is a NEW fire wall pad for 1970-1981 Camaro or Trans Am AC Car. For use on your cabin floor replacing the factory style sound deaden-er and can also be used to line cabin walls, and headliners and door panel under-layment. 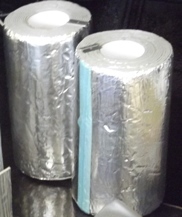 This foil style insulation and sound deadener comes in a 3 roll set. HushMat Ultra is a 1.5mm (approx. 1/8") thick pressure-sensitive, constrained-layer damping material with excellent adhesion properties. HushMat Ultra comes in easy to handle square or rectangular sheets that are easily hand-cut with scissors or a utility knife. No special tools are required for installation. HushMat Ultra is a 1.5mm (approx. 1/8") thick pressure-sensitive, constrained-layer damping material with excellent adhesion properties. HushMat Ultra comes in easy to handle square or rectangular sheets that are easily hand-cut with scissors or a utility knife. HushMat Silencer Megabond sound absorbing foam is formulated to withstand the wide range of temperatures that impact the automobile. Silencer Megabond is a unique, semi-closed cell EPDM rubber formula that absorbs high frequency airborne noise from engine, aftermarket exhaust and wind noise transmitted through the air and provides outstanding thermal insulation. 1" X 20" ROLL HUSHMAT QUIET TAPE Designed to eliminate vibration and rattles caused by loose wire harnesses and cables. Simply peel and stick, bridging over the wire or cable. Also eliminates unnecessary wear of wire and cable due to excessive vibration. Another unique solution from HushMat! Order just what you need for the specific area of your car! Be it doors, trunk pan and walls, headliner or floor pan, HushMat has a kit for exactly what you are working on!HushMat Ultra is a 1.5mm (approx. 1/8") thick pressure-sensitive, constrained-layer damping material with excellent adhesion properties. HushMat Ultra comes in easy to handle square or rectangular sheets that are easily hand-cut with scissors or a utility knife. No special tools are required for installation. The HushMat Ultra silver is more conducive to paint operations, while the HushMat Ultra black is designed to be applied post paint and for surfaces that may be exposed to light (non-reflective). Ultra H2O damping and sealing paste is great for damping and sealing hard to reach areas of the automobile. Dampens the inside of door frames and quarter panels. Seal speaker enclosures, body panels, and mate metal surfaces. Cleans up easily with water. Ultra H2O tubes come with easy squeeze screw on nozzle. Applies with standard size caulk gun. Cures in less than 3 hours and retains flexibility. Paintable and sandable once cured! 4' X 6' FOIL BACKED CARPET SOUND / HEAT DEADENER Make the inside of your vehicle quieter and cooler with this under carpet combination heat shield and sound deadener. 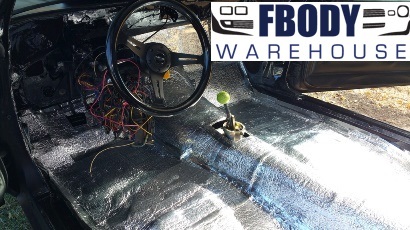 For use on 1970 - 1981 Camaro and Firebird Trans Am Models Select from * With Factory Air Conditioning *With OUT Factory Air Conditioning (NON -AC) *No Heater or heater hose option (custom or racing) Each QuietRide Firewall Insulator is year/make/model specific to fit just like the original. Sporting unmatched craftsmanship, these firewall insulators are made with the highest quality materials available and are molded to fit over the transmission hump and into the heater well. This reproduction plug holds the firewall insulation pad in place on various GM models. It is manufactured from rubber and features the correct GM part number (3868790) stamped in as original. Quantities vary by model. Use as needed. Enjoy more music with less noise with Dynamat! With simple sound-deadening sheets, you're left wondering, "How much do I need for my car? Where does it go?" This two-stage automotive insulation and sound damping system gives older cars the "quiet riding comfort' of today's modern vehicles. AcoustiShield sets are designed on current "state-of-the-art" automotive acoustic technology to insulate the cabinand control noise, heat and vibration inside the car. Sets include pre-sized damper pads, pre-trimmed heat shield/barrier panels, spray adhesive and sealing tape. Each set includes fully illustrated instructions for an easy and painless two-hour install. Note: Shipped via ground ONLY. 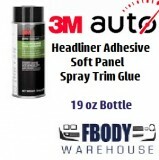 This can be used in any vehicle in the entire interior such as your floor pan, doors, under carpet/seats, headliner/roof, trunk, trunk lids, firewall (interior side), and under your hood as a hood liner.